Grocery Tote Bags are a great promotional product for trade shows, corporate giveaways and promotional events. This unique customizable product is just one of many personalized imprinted or engraved custom items in our massive inventory. Products at Heritage Advertising vary from travel mugs, water bottles and sports bottles to hand fans, emery boards, frisbees and tote bags. Be sure to browse all of our products to make sure you get the most out of your promotional marketing campaign, especially the rest of our Tote Bags. And if you don't find a product you're looking for, call us to see if we have added it yet. 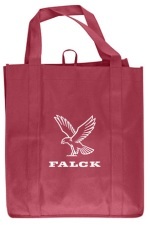 A tote bag is a large hand held bag or purse that is used to carry things, such as books, beach wear, or everyday items. A tote bag is normally made of treated canvas, nylon or heavy pebbled leather. 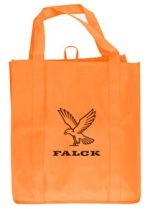 Some totes come with a zipper compartment that divides the bag into sections. 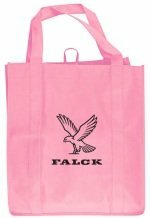 Standard Imprint Colors: 012 yellow, 123 athletic gold, 165 orange, 349 green, 802 neon green, 812 neon pink, 2695 purple, 2925 light blue, white, black, metallic gold, metallic silver.